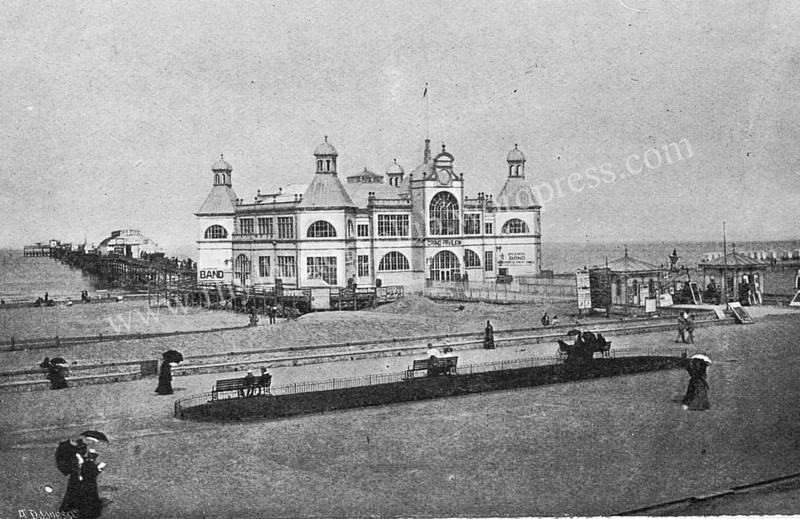 On Tuesday, February 24th, 1891 a meeting was held at the Town Hall to discuss the proposed building of a Grand Pavilion at the entrance to the pier. Mr R. D. Roberts (Mwrog) was the Chairman and stated that whilst Rhyl was blessed with the finest and safest beach on the whole coast, the town needed more entertainment facilities. He went on to say that Llandudno attracted visitors in their thousands to its concerts at their Pier Pavilion, something that Rhyl should emulate. Things moved quickly and there was only 14 weeks between the first brick being laid in the foundations and the opening night. The theatre was opened by Lady Florentia Hughes of Kinmel Hall on Saturday, September 12th 1891. The local newspapers described the theatre’s appearance to that of an “Eastern Palace”, “Mosque like” and having a “Moorish style of architecture”. It was designed by Messrs Darbishire and Smith of Manchester as a Concert Hall. Except for its foundation it was built entirely of wood and iron. It was originally intended to have a large glass dome, but in the event it did not, due to financial restrictions. It had a clock face 6′ in diameter above the grand entrance. Later, the Rhyl Record and Advertiser described it as an “elegant and graceful structure until the proprietors succumbed to the blandishments of the advertising fiend”! (A photograph of the theatre in Philip Lloyd’s book “Glorious Rhyl” shows the building surrounded by advertising hoardings for Lifebuoy soap, Sunlight soap and Royal disinfectant”). Inside the facilities were ideal, there was full view of the stage from every part of the hall, whilst the acoustic properties were exceptionally good. It could hold 3,000 people. 2,500 chairs were purchased and the local paper described how the Directors also purchased 200 armchairs “for paterfamilias and matrons of extra sizes”! The whole building was heated by an excellent system of hot water pipes. The orchestra area measured 50’x21′ and was able to accommodate 250 performers. The icing on the cake was the successful purchase of the grand organ, built for the Jubilee Exhibition of Manchester by Messrs Bishop and Son, and the securing of the services of a musical director who ranked as one of the best in England – Mr Edward de Jong. The organ cost £4,000, had 3,095 pipes and the Grand Theatre boasted that their organ recitals could not be experienced anywhere outside St. George’s Hall in Liverpool or Crystal Palace in London. Almost exactly ten years after the opening, the theatre burnt down on September 14th, 1901. To read more about its sad demise click here. A week later, on September 21st, the Rhyl Record and Advertiser reflected on the Theatre’s brief history. It said “ever since it was erected in 1891, misfortune and ill luck have persistently pursued it”. It went on to explain that after the initial success patronage was not sufficient to match the expenditure and as a consequence the quality of the entertainment deteriorated. There was a lack of public support, a strain on finances, disagreement amongst the directors and between directors and shareholders. The original founders and directors one by one severed their connection with the company. The whole concern then fell into the hands of Messrs Carter and Warhurst who made huge efforts to obtain public support which may have succeeded had it not been for the fire.